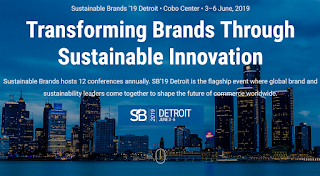 Sustainable Brands '19 Detroit will take place at the Cobo Center on June, 3–6, 2019. Sustainable Brands hosts 12 conferences annually. 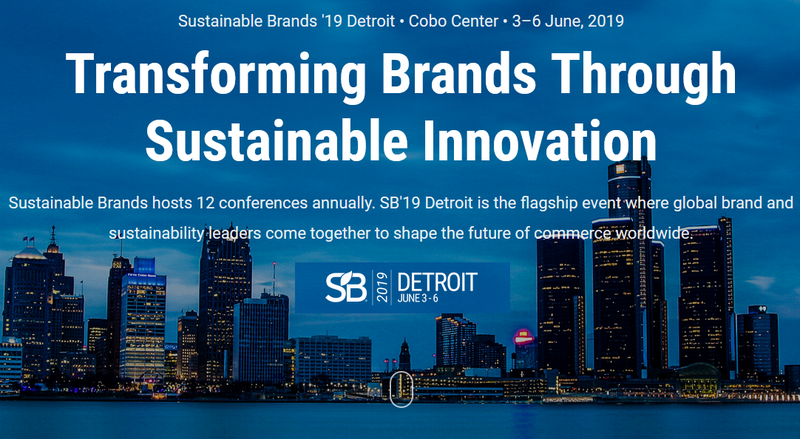 SB'19 Detroit is the flagship event where global brand and sustainability leaders come together to shape the future of commerce worldwide. Since its inception, the SB community has worked to redefine the path to brand success by inspiring and enabling breakthrough innovation for environmental and social benefit. The market is hungry for meaningful purpose-led brands. SB’19 Detroit, will help you authentically leverage science, technology, storytelling and unlikely partnerships to win in the marketplace and deliver the good life in a changing world. Within a landscape of economic and political volatility, many of the world’s largest businesses are being cast as irrelevant, insincere. Disruptors and D to C brands are redefining the marketplace while established brands are struggling to maintain growth. Market changing consumers are demanding more. According to research conducted by both Sustainable Brands and Harris Poll, consumers are shifting away from the pursuit of money, status and personal achievement, focusing instead on balance, simplicity, along with greater connection to family, community and the environment as a foundation of a good life. Moreover, consumers are looking to brands to bring those elements into their daily lives and 80% of them say they will financially support brands who help them live a good life. At SB’19 Detroit, brands can gain the tools they need to move from traditional marketing to mattering to people and learn how to incorporate the concepts of ‘balance,’ ‘simplicity’ and ‘moderation’ that consumers now crave. They can use science, technology, storytelling and unlikely partnerships to meet the underlying demand for the good life and ultimately win in the market. SB’19 Detroit will be the largest gathering of change makers representing many of the world’s largest global brands, disruptive social entrepreneurs, NGOs, investors, academia plus a multitude of other stakeholders that support them. Some of those that will be present: Aldo | Manager, Community Engagement Aldo | Manager, Sustainability Aldo | Vice President, Communications, Culture & CSR Gap Foundation | Manager The Kroger Co. | Regional Director Corporate Affairs Causegear | Made by Free Women | Chief Marketing Officer Macy’s Inc | Procurement Sustainability Manager La Maison Simons | Director of Store Development Tommy Bahama | PM Women’s & Sustainability Tommy Bahama | EVP Sourcing & Production prAna Living | Director of Sustainability REI | VP Brand Stewardship & Impact REI | Director of Sustainability Target | Senior Director, Corporate Social Responsibility The TJX Companies, Inc.